Sunday night, Chip Kelly reinserted Tim Tebow mania into the sports world. Agreeing to a one-year deal with the 27-year-old quarterback tops off what can be described as an eventful offseason for the Philadelphia Eagles (to put it lightly). Kelly traded his best offensive player, LeSean McCoy, his quarterback, Nick Foles, and watched his top wide receiver, Jeremy Maclin, sign with Kansas City. On the other hand, he has signed pro bowl running back Demarco Murray, traded for quarterback Sam Bradford, and now brought in ideal Nicholas Sparks movie protagonist Tim Tebow. Tebow? Really? This means the Eagles now have three of the top five most inaccurate passers in the NFL over the last five seasons. Philadelphia’s presumed starter, Bradford, has a career QBR of 40.7. Backup Mark Sanchez’s? Just shy of that, sitting at 40.4. Tebow takes the cake however boasting a career QBR of 33.4, which fits the bill for the lowest in the NFL. Sanchez improved last year under Kelly’s system, as did former Eagles QB Nick Foles. Ideally for the Philly faithful, the same will happen with Bradford and Tebow. Kelly has treated these past few months like a crazed science experiment. Tim Tebow just happens to be the newest and most intriguing variable he’s brought into his lab. For all we know, Tebow could be cut before training camp even comes to a close. But for now, he adds a whole lot of fun to the already absurd Eagles’ offseason. Sanchez played with Tebow in New York during the 2012 season, so maybe Chip is just trying to get the band back together. Whatever his reasoning is, Kelly hasn’t shied away from strange moves. And by signing Tebow, this maniacal scientist from Oregon has just taken over SportsCenter for the next few months. So where does Kelly go from here? Does he draft Oregon quarterback Marcus Mariota? Or maybe he’ll try to sign Albert Haynesworth? At this point, no one knows what Chip Kelly’s next move is. I’m not even sure if he does. But one thing I do know is that he’s an expert on how to keep an NFL offseason interesting. This whole ordeal could turn out to be the greatest thing for the Eagles franchise since Terrell Owens did sit ups in his driveway. Or it could completely blow up in Chip Kelly’s face. I guess we’ll just have to wait and see. 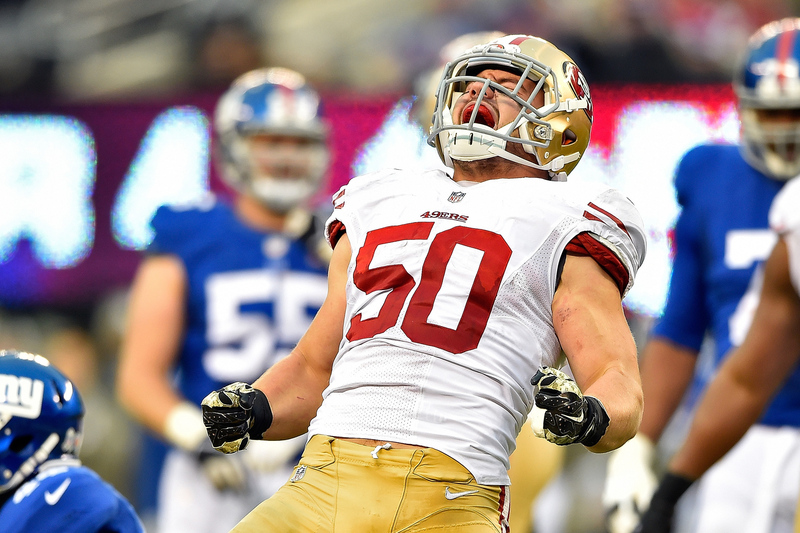 Yesterday we learned that San Francisco 49ers linebacker Chris Borland will be retiring at the young age of 24. Coming off a strong rookie campaign, this news seemed pretty odd. Why would a player with so much potential end his career like this? One more solid season and he would put himself in line for a contract in the neighborhood of $30 million. That’s a lot of money to turn down. As dumb as this may sound to the average joe, there’s a much bigger issue present here. Generally when people think about their future, they think about their family, their job, and their health. You want to be able to talk and interact with your family, do the things you love without any issue, and sleep well at night. I would say these are all pretty normal standards that most people would like to have. Well what if all of those were threatened? What if there was a possibility that talking to your family would be a difficult task to complete? Doing the things you love would no longer be an option because of your health. Chances are you’d do a whole lot to try to avoid that terrifying situation. Well Chris Borland is no different. The question ultimately comes down to quality of life vs millions of dollars. Bashing heads with other humans at a consistent basis definitely falls under the category of occupations that put your quality of life at risk. Chronic traumatic encephalopathy (CTE) has been the dark shadow of physical sports for the past decade. It’s the touchy topic that nobody wants to address, but everyone is afraid of. 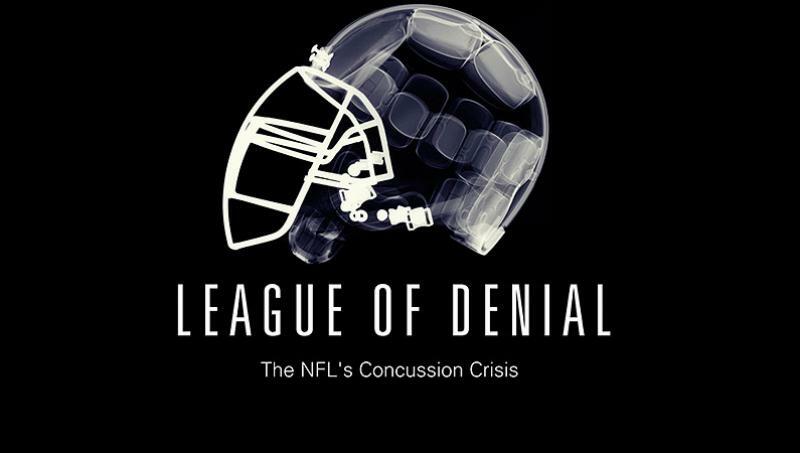 The NHL and NFL have both had their fair share of events with ties to the devastating brain disease. Mike Webster, Dave Duerson, Ray Easterling, and Junior Seau are just a few names that come to mind. All of these NFL players’ deaths were tied to CTE. Bob Probert, Rick Martin, Derek Boogaard, Wade Belak, and Rick Rypien are a handful of NHL players whose deaths have also been ruled as CTE-related. These sports are brutally physical and that won’t change; but the way issues like CTE are addressed and handled need to be adjusted at some point in time. The NFL has created strict concussion rules over the last few years to try and help decrease head injuries. This is a good start but still doesn’t do the trick. In the second half of this year’s Super Bowl, New England Patriots’ wide receiver Julian Edelman was sandwiched by two Seattle Seahawk linebackers while running up field. Crawling on all fours after the hit, he slowly gathered himself and, with the help of three teammates, got back onto his feet. Edelman stumbled around for the remainder of the game and required the help of others to get back upright on almost every play. After the game, it was reported that he had passed a concussion test on the sideline and was cleared to play by the team trainer. Unless this test was a coach asking “Julian you good?”, there’s no way in hell that man cleared a league-approved test. Edelman thought he was playing tennis for the last ten minutes of that game and everyone knew it. It’s things like this that lead players like Chris Borland to make the wise decision to call it quits when they start down a dark road. This offseason has seen a pattern of young players retiring. Borland’s teammate, 30 year old pro bowler Patrick Willis retired in the prime of his career due to fears of serious injuries. Jake Locker (26) and Cortland Finnegan (31) also followed suit. This is a scary pattern for the NFL. Will it become a major trend? Who knows. But what we can hope for is that is will make the NFL and even NHL take a closer look at a seriously terrifying issue they have on their hands. At some point it becomes a question of how much these guys value their lives once their professional careers are over and even how much the leagues value their athletes’ lives. Concussion issues and CTE are two things that can no longer just be viewed at the surface. I commend Chris Borland for taking a stand and doing what he felt was the smart decision. It takes a man to do the logical. Since the start of free agency this past Tuesday, the AFC East has quickly become one of the tougher divisions in all of football after being relatively mediocre over the last few seasons. Ndamukong Suh going to Miami, LeSean McCoy to Buffalo, and the return of Darrelle Revis to the Jets all seem to have some New England Patriot fans going into full panic mode. There hasn’t been an AFC East this strong in years and what is the Patriots front office doing about it? Nothing! All the Pats have done so far is let stars Darrelle Revis, Vince Wilfork, Shane Vereen, and Brandon Browner gracefully leave the team. They are doomed. The Pats are ruining their team! “They’d be lucky to be .500”, I heard a family friend say. Maybe these fans have just jumped on the bandwagon post-Super Bowl, or maybe they have amnesia. What about when the Patriots cut Lawyer Milloy? Ty Law? Mike Vrabel? Adam Vinatieri? Wes Welker? Asante Samuel? Traded Richard Seymour? The list goes on for days. This is the Belichick system. This is the Patriot way. Cutting Lawyer Milloy on September 2nd, 2003 was the biggest head-scratcher I’ve ever witnessed. He was 29 years old, in the prime of his career, and the center of the Patriots’ defense; but Belichick let him go. What happened after that? The Patriots went on to win the Super Bowl that very season. So what is making these Pats fans doubt their head coach and GM now? There is no reason for Patriot fans to panic in any way shape or form. 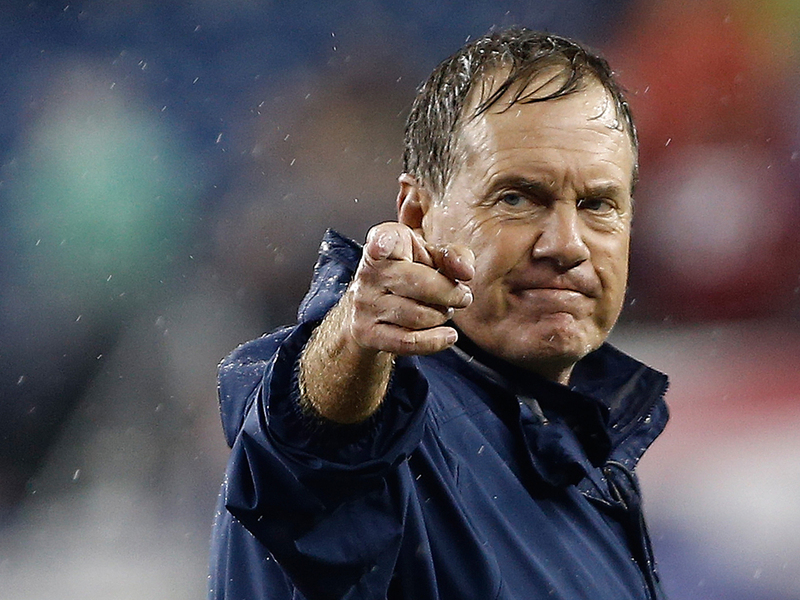 Belichick has never made a splash in the first few days of free agency nor in the first round of the NFL Draft. That’s just not his style. And, correct me if I’m wrong, I think he’s done just fine to this point in his coaching career. Everyone knew coming into this season Belichick wasn’t going to pick up Revis’ $20 million option. 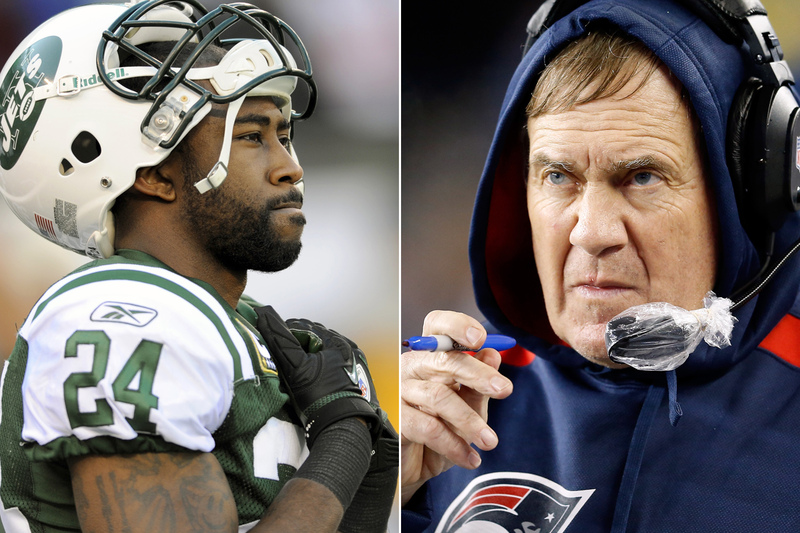 Throw the Jets’ lucrative offer into the equation and there’s no way Revis returns to New England. The Jets are now paying a 30-year-old corner $39 million guaranteed. Putting that kind of money towards one player is not the Belichick system. Sure it would have been nice to bring back Browner but I’m not convinced he’s worth the money the Saints will be giving him either. Browner is great with a counterpart like Revis. Before Revis he had Sherman, and before he had Sherman he was a non-factor. Yes the AFC East is improving. But is Miami giving one player a $114 million dollar contract an improvement? Is the Jets bringing back their former two cornerbacks (who are now three years older) on lucrative front-loaded contracts an improvement? These seem like some pretty questionable front office decisions in my opinion. Of course these teams will be better off this season than they were last; but if I’m a supporter of either squad, I’m a little concerned for five years from now and still concerned about playing Tom Brady. The Patriots plan long-term more than any other team and always have. If Brady and Bill Belichick are steering the ship, I cannot find a single reason to have any concern. The rest of the AFC East is making springtime front page news and definitely stirring the pot. However I remain pretty convinced that the Pats will be the AFC East team making the front page headlines once again come winter time. So Patriot fans, sit back and relax. Let the mastermind run his offseason scheme just as he has for the last ten years and everything will be just fine. Beast Mode, gold grills, and skittles. Three things that make Marshawn Lynch great. A lot of people would probably say the exact opposite. Many think he’s thug who’s too quiet. “He’s a jerk”, one of my professors claims. Or is he just an introvert who won’t change? I’ll take the latter and bet the house. It’s people like Marshawn Lynch who make sports great. Of course he could be nicer to the media and yeah maybe he could answer a question every now and then with a real answer. But that’s not Marshawn so why would he change? His tendencies anger people. He gives one word answers to the media and doesn’t like to talk. Unless it’s about skittles. Then he’ll talk for days. I can’t blame the guy for not wanting to talk to the media before and after games. Just sit and listen in on an NFL post-game press conference and you’ll be able to realize how useless some of the questions are that are asked. You could use about any one of his post-game pressers as an example but I’m going to take the “Thanks for asking” themed interview from December, 21st after a win in Arizona. Here we see, per usual, Lynch gives the reporters nothing. They get mad and leave, he gets fined, and everyone goes about their lives. But listen to the way those questions were phrased. “Can you describe the 79 yard touchdown run?” “How about the stomach issue early in the game?” “Can you take us through the run?” Maybe it’s just me but I think the effort is pretty poor on the reporting side too. I wouldn’t want to answer those dumb questions either. They seem more like prompts than questions to me but hey, maybe that’s why I’m not in the NFL. This kind of stuff ticks people off. They get mad at his quiet and mean responses. He doesn’t want to talk so he’s not going to and that makes people mad. I get that. But Marshawn being Marshawn is another example of how personalities in the world of sports make it the most fun world of all. After all, he’s giving us something to talk about, isn’t he? Finally this past weekend, he talked to reporters regarding the play that lost his team this year’s Super Bowl. Rather than give Lynch, arguably the best running back on the planet, the ball, Pete Carroll and the Seahawks elected to pass and eventually throw the season away (making me happier than a kid on Christmas morning). Of course in classic, obscure, Marshawn Lynch fashion, it was a Turkish sports network with whom he spoke. My first thought was, “What in God’s name is he doing in Turkey?” Well in case you were wondering the same, he and a few other NFL players are overseas helping to run a football camps across the region. He gave a full interview and answered all of the questions politely and fully. Why now and why Turkey? We’ll never know. 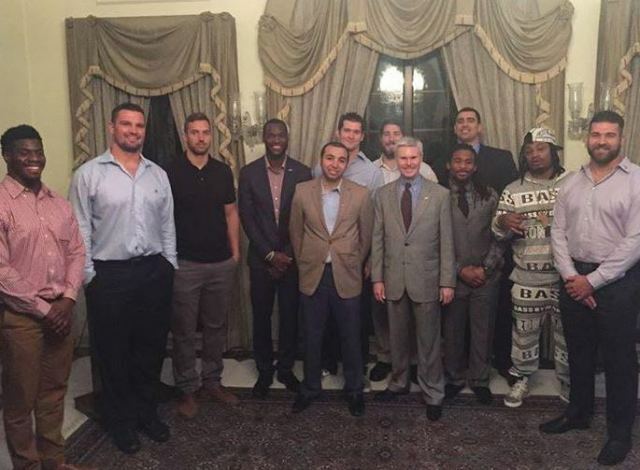 But it’s just Marshawn being Marshawn. One thing I do know however is that while in Turkey, he attended an “American Football Without Barriers” event and wore this. If that’s not business casual I don’t know what is. He’s real. He’s going to be himself and he doesn’t care what you think. As rude and stubborn as you may find him, I think he’s entertaining, original, and fun. There’s no way you can tell me that outfit is not fun. (But if you could tell me what exactly he’s wearing that would be great because I have no idea.) Yes he could be kinder to reporters. Yes he could be more outgoing. Yes he could act less childish. But why would he? That’s not Marshawn and that’s not fun. He does his job to superb levels on the field and is known for being an awesome teammate. Those things mean the most to Marshawn. 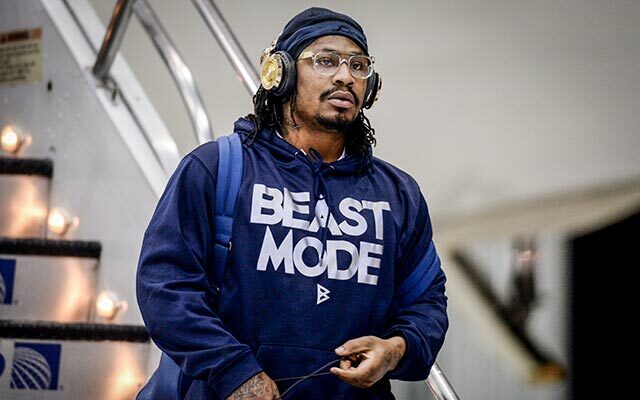 Anyone else’s opinion is probably pretty far down the Beast Mode totem pole. If the American media really wants him to be more outspoken, for God’s sake ask the man about Skittles. 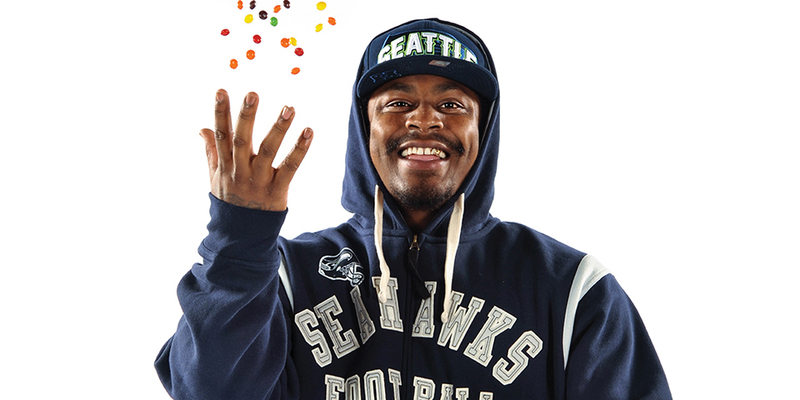 Nobody loves Skittles like Marshawn loves Skittles.